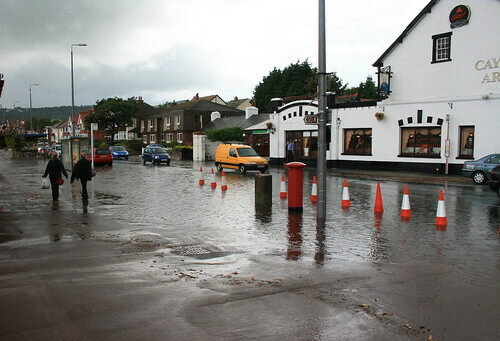 Almost exactly a year after the local area was hit by flash flooding, we received another torrential deluge yesterday, with several homes and businesses being inundated by the water. There's a Daily Post report about it here. ...which is very true, of course. However, there's a little more to it than that, I feel. The fact is that we are actively working against nature with the use of so much concrete and tarmac surfacing in our towns & villages - this prevents large volumes of rainwater from soaking away naturally into the ground and means they are instead channelled into antiquated drainage systems that cannot cope with the large flows. The trend of concreting over front gardens to form parking areas has also not helped. Perhaps we need to take a step back and start looking at how we could work with nature to control the effects of flash flooding by using soakaways and attenuation tanks, instead of assuming (falsely, it would seem) that we can control it? I believe Planning Policy has already made strides in this direction when dealing with new developments but perhaps a wider strategy in the community is needed if we are to prevent the flash flood becoming a yearly occurrence?